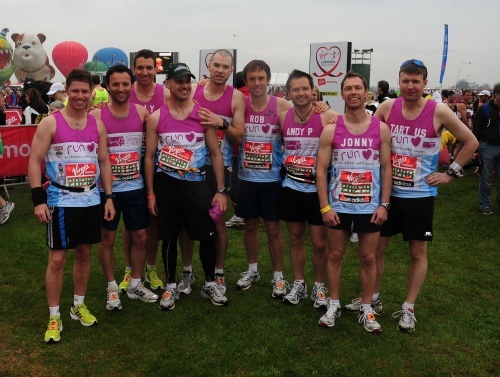 BRDC MEMBERS RUN THE MARATHON! Among the 35,000 runners in Sunday’s Virgin London Marathon, the British Racing Drivers’ Club had 14 representatives running in support of CLIC Sargent. It started as an idea of Olly Gavin’s last Autumn and he discussed it with BRDC Director Ross Hyett at the BRDC Awards Lunch. It grew from there and the drivers have been training hard for weeks. The BRDC team included some of the top young racing drivers in the country and they all banded together under their Club flag to raise a target of £50,000 for children suffering from cancer and leukaemia. Andy Priaulx, Oliver Gavin, Darren Turner, Jonny Kane, Johnny Mowlem, Guy Smith, Charlie Hollings, Rob Barff, Richard Westbrook, Peter Dumbreck, Marino Franchitti, Stuart Hall, Marc Hynes & BRDC Club Secretary, Stuart Pringle stepped up to the 26.2 mile challenge to raise funds and awareness for this worthwhile charity. Sadly Sean Edwards was unable to run due to racing commitments in Germany but will be scheduling a date on his return to run his own marathon. CLIC Sargent is a well established children’s cancer charity, providing clinical, practical and emotional support to children, young people and their families. Their work includes providing specialist nurses to provide care during hospital stays and visits; these nurses can also visit the child's home to provide some treatments. Other than clinical care, they provide a helpline, family care & support, financial support, holidays, play specialists and services for young children. An important arm of their charity is the vital research that is dedicated to improving survival rates, reducing side effects and minimizing the emotional impact of childhood cancer. To help with fundraising, the BRDC and runners hosted a Charity Lunch at Plaisterers’ Hall, London on Friday 23 April. A host of top names from British Motorsport attended with BBC’s F1 presenter Jake Humphrey compering for the afternoon. Prior to the lunch, the runners had already raised an incredible £40,000 on the JustGiving page (www.justgiving.com/BRDC-marathon-legends). With the auction, led by BRDC Chairman Robert Books, silent auction and pledges, guests were extremely generous and raised an astonishing further £35,000! The marathon itself bought new personal best times with Olly Gavin running a very impressive 02:54, Jonny Kane (marathon debut) and Stuart Hall both coming in at 02:59. The whole team did fantastically well, especially making great efforts to get to the UK with the air travel problems last week.